1 What are Red Flags? Clinical findings that increase the level of suspicion that there is a serious medical condition presenting as common, non-serious, musculoskeletal conditions, are commonly described as red flags. International guidelines for assessment of lower back pain and neck pain is to be able to rule out serious pathology and identify red flags. Red flags are features from a patient's subjective and objective assessment which are thought to put them at a higher risk of serious pathology and warrant referral for further diagnostic testing. They often highlight non-mechanical conditions or pathologies of visceral origin and can be contraindications to many Physiotherapy treatments. Although red flags have a valid role to play in assessment and diagnosis they should also be used with caution. Some guidelines contain no information on diagnostic accuracy for individual red flags, so it is the responsibility of individual practitioners to make themselves aware of these. Other guidelines even recommend immediate referral to imaging if any red flag is present, which could lead to many unnecessary referrals if clinicians did not clinically reason their referral. It is hard to get an exact picture of the epidemiology of red flags as it depends heavily on the level of documentation by clinicians. One study of low back pain suggested that “the documentation of red ﬂags was comprehensive in some areas (age over 50, bladder dysfunction, history of cancer, immune suppression, night pain, history of trauma, saddle anaesthesia and lower extremity neurological deﬁcit) but lacking in others (weight loss, recent infection, and fever/chills)”. Clinicians must be aware of the key signs and symptoms associated with serious medical conditions that cause spinal pain and develop a system to continually screen for the presence of these conditions. In the UK, age above 55 years is considered a red flag, this is because above this age, particularly above 65, the chances of being diagnosed with many serious pathologies, such as cancers, increase. A patient history of cancer and also family history of cancer should be established, particularly in a first degree relative, such as a parent or sibling. The most common forms of metastatic cancer are: breast, lung and prostate. This should depend on a patients previous weight and it is sometimes more useful to consider percentage weight loss. A weight loss of of 5% or more within a 4 week period is a rough indicator of when unexplained weight loss should cause alarm. Constant Pain - This needs to be true constant pain that does not vary within a 24 hour period. Thoracic Pain - The thoracic region is the most common region for metastases. Severe Night Pain - This can be linked to be objective history if the patient's symptoms are brought on when they are lying down or non weight bearing. Abdominal pain and changed bowel habits but with no change of medication - A change is bowel habits can be a red flag for cauda equina. This can also be considered a yellow flag and should be taken with caution as many patients suffer episodic lower back and neck pain. However, patients who initially respond to treatment and then relapse may be a cause for concern. The therapist should determine if the patient is unwell objectively however this is a very subjective concept. The following signs may indicate that the patient has a systemic serious pathology. Deformity of the spine with muscle spasm and severe limitation of movement are suggested to be key indicators of serious spinal pathology. A rapid onset of a scoliosis may be indicative of an osteoma or osteoblastoma however this may not be apparent in standing. Physiological movements are often required to determine a rapid onset scoliosis. Some spinal tumors can be large enough to be seen or felt. Swelling and tenderness may be the first sign of a tumour. It is also common for spinal tumours to limit physiological movements. This is suggested to be synonymous with spinal pain and is therefore difficult to determine if it is associated with a red flag pathology. If a serious spinal pathology is present, the muscle spasm may be severe enough to be a cause of scoliosis in the spine. The correlation between muscle spasm, pain and other objective clinical measurements however, are poorly supported by strong evidence. Patients who report neurological signs in the subjective assessment require a neurological assessment. A neurological deficit is rarely the first presenting symptom in a patient with serious spinal pathology however 70% of patients will have a neurological deficit at the time of diagnosis. Dermatomes, myotomes and reflexes should be examined. The upper motor neuron pathways should also be examined via extensor plantar reflex (Babinski), clonus and hoffmans. If brisk, it may indicate a upper motor neuron pathology. In differential diagnosing serious spinal conditions we should understand the best tests for each spinal pathology and/or clusters of tests. The best tests are: reliable, low cost, have validated findings and high diagnostic accuracy i.e. specifictiy and sensitivity). To objectively test for a compression fracture in the lumbar spine the examiner stands behind the patient. The patient stands facing a mirror so that the examiner can gauge their reaction. The entire length of the spine is examined using firm, closed-fist percussion. It is positive when the patient complains of a sharp, sudden pain. In the cervical spine the Canadian C-Spine Rule can be used to identify when people should be sent for radiography. Shows sensitivity and specificity of the signs and symptoms associated with cauda equina. The use of red flags should not replace clinical reasoning but used as an adjunct to the process. A lone red flag would not necessarily provide a strong indication of serious pathology. It should be considered in the context of a person's history and the findings on examination. Patients’ inappropriate misattribution of insidious symptoms to a traumatic event is common and can be misleading. Clinical reasoning is only as good as the information on which it is based indicating the importance of thorough questioning in the subjective assessment. Red Herrings for serious spinal pathology may include spinal stenosis, lower limb edema, nerve root compression, peripheral neuropathy, cervical myelopathy, alcoholism, diabetes, MS and UMND. Due the abundance of red herrings that can be present, it is important the the therapist interprets the red flags in the context of the patients current presenting condition and not singularly. If red flags are identified in the spine, the should first consider if onward referral is appropriate. If serious enough, the therapist may refer onto Accident and Emergency such as in the case of cauda equina syndrome and fractures Otherwise further specialist medical opinions can be gained, this may be referral onto a specialist spinal clinic. Failure to improve after one month is a red flag and the patient can be referred back to the GP for continued management and further diagnostic tests as required  The GP will be able to refer the patient on to have x-rays, CT/MRI, blood tests or nerve conduction studies. It has been suggested that to reduce the rate of false alarms, the patient should be referred back to the GP in the first instance to undertake further investigations as required before more advanced imaging is undertaken. ↑ Koes B, van Tulder M, Lin C, Macedo L, McAuley J, Maher C. An updated overview of clinical guidelines for the management of non-specific low back pain in primary care. European Spine Journal. 2010;19(12):2075-94. ↑ Childs, J.D., Cleland, J.A., Elliott, J.M., Teyhen, D.S., Wainner, R.S., Whitman, J.M., Sopky, B.J., Godges, J.J., Flynn, T.W., Delitto, A. and Dyriw, G.M., 2008. Neck pain: clinical practice guidelines linked to the International Classification of Functioning, Disability, and Health from the Orthopaedic Section of the American Physical Therapy Association. Journal of Orthopaedic & Sports Physical Therapy, 38(9), pp.A1-A34. ↑ Henschke N, Maher C, Ostelo R, de Vet H, Macaskill P, Irwig L. Red flags to screen for malignancy in patients with low-back pain. Cochrane Database of Systematic Reviews. 2013(2). ↑ Downie A, Williams C, Henschke N, Hancock M, Ostelo R, de Vet H, et al. Red flags to screen for malignancy and fracture in patients with low back pain: systematic review. British Medical Journal. 2013;347. ↑ Gordon Higginson. Clinical Standards Advisory Group. Qual Health Care. 1994 Jun; 3(Suppl): 12–15. ↑ 6.00 6.01 6.02 6.03 6.04 6.05 6.06 6.07 6.08 6.09 6.10 6.11 6.12 6.13 6.14 Greenhalgh, S. and Selfe, J. Red Flags: A guide to identifying serious pathology of the spine. Churchill Livingstone: Elsevier. 2006. ↑ Leerar, P J, Boissonnault, W, Domholdt, E and Roddey, T. Documentation of red flags by physical therapists for patients with low back pain. The Journal of Manual and Manipulative Therapy. 2007; 15 (1): 42 – 49. ↑ Deyo, R and Diehl, A. Cancer as a cause of back pain – fequencey, clinical presentation and diagnostic strategies.Journal of General Internal Medicine. 1988;3(3):230-8. ↑ Eveleigh, C. Red Flags and Spinal Masquereders. [online]. Available at : www.nspine.co.uk/.../09-nspine2013-red-flags-masqueraders.ppt‎. Accessed 13/01/14. 2013. ↑ 11.0 11.1 11.2 11.3 Greenhalgh, S. and Selfe, J. 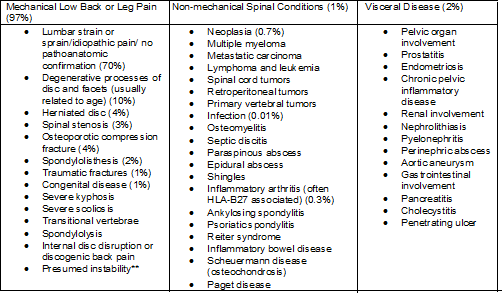 A qualitative investigation of Red Flags for serious spinal pathology. Physiotherapy. 95, pp: 223 – 226. 2009. ↑ Petty, N. J. and Moore, A. P. Neuromuscular examination and assessment: a handbook for therapists. Edingburgh: Churchill Livingstone. 2001. ↑ 13.0 13.1 Sackett, D.L., Straws, S.E., Richardson, W.S., et al. (2000) Evidence-based medicine: How to practice and teach EBM. (2nd ed.) London: Harcourt Publishers Limited. ↑ Van den Bosch MAAJ, Hollingworth W, Kinmonth AL, Dixon AK. Evidence against the use of lumbar spine radiography for low back pain. Clinical Radiology 2004;59:69-76. ↑ Roman M, Brown C, Richardson W,Isaacs R, Howes C, Cook C. The development of a clinical decision making algorithm for detection of osteoporotic vertebral compression fracture or wedge deformity. Journal Manipulative Physiological Therapeutics 2010;18:44-9. ↑ Patrick JD, Doris PE, Mills ML, Friedman J, Johnston C. Lumbar spine x-rays: a multihospital study. Annals Emergency Medicine 1983;12:84-7. ↑ Scavone JG, Latshaw RF, Rohrer GV. Use of lumbar spine films. Statistical evaluation at a university teaching hospital. JAMA 1981;246:1105-8. ↑ Gibson M, Zoltie N. Radiography for back pain presenting to accident and emergency departments. Archives Emergency Medicine 1992;9:28-31. ↑ Deyo RA, Diehl AK. Lumbar spine films in primary care: current use and effects of selective ordering criteria. Journal General Internal Medicine 1986;1:20-5. ↑ Langdon J, Way A, Heaton S, Bernard J, Molloy S. Vertebral compression fractures: new clinical signs to aid diagnosis. Annals Royal College Surgeons England 2009 Dec 7. ↑ Reinus WR, Strome G, Zwemer FL. Use of lumbosacral spine radiographs in a level II emergency department. AJR American Journal Roentgenology 1998;170:443-7. ↑ 23.0 23.1 Deyo RA, Jarvik JG. Diagnostic evaluation of low back pain with emphasis on imaging. Ann Intern Med. 2002;137:586-97. ↑ Jacobson AF. Musculoskeletal pain as an indicator of occult malignancy. Yield of bone scintigraphy. Archives of International Medicine 1997;157:105-9. ↑ Frazier LM, Carey TS, Lyles MF, Khayrallah MA, McGaghie WC. Selective criteria may increase lumbosacral spine roentgenogram use in acute low-back pain. Archives of International Medicine 1989;149:47-50. ↑ Deyo RA, Diehl AK. Cancer as a cause of back pain: frequency, clinical presentation, and diagnostic strategies. Journal General Internal Medicnie 1988;3:230-8. ↑ Cook C, Ross MD, Isaacs R, Hegedus E. Investigation of nonmechanical findings during spinal movement screening for identifying and/or ruling out metastatic cancer. Pain Practice 2012;12:426-33. ↑ Mercer, C., Jackson, A., Hettinga, D., Barlos, P., Ferguson, S., Greenhalgh, S., Harding, V., Hurley Osing, D., Klaber Moffett, J., Martin, D., May, S., Monteath, J., Roberts, L., Talyor, N. and Woby, S. Clinical guidelines for the physiotherapy management of persistent low back pain, part 1: exercise. Chatered Society of Physiotherapy. [online]. Available at: http://www.csp.org.uk/publications/low-back-pain. Accessed 13/01/14. 2006. ↑ Greenhalgh, S. and Selfe, J. Malignant Myeloma of the spine: Case Report. Physiotherapy. 89 (8), pp: 486 – 488. ↑ Hensche, N. and Maker, C. Red flags need more evaluation. Rheumatology. 45, pp: 921. 2006.